Peyto Lake is one of the treasures in the Canadian Rockies. 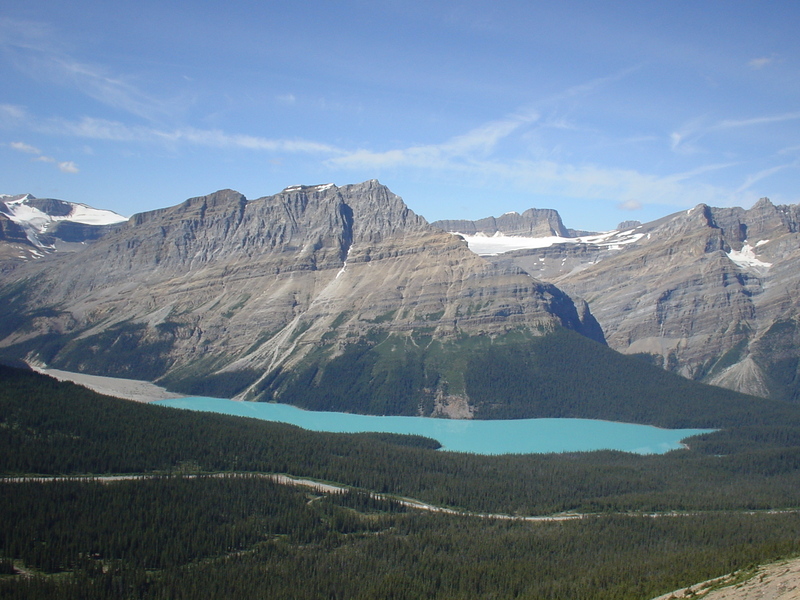 The 2.8 km or 61 feet length and elevation lake of 1860 m, make this turquoise diamond shape lake perfectly shine in The Canadian Rockies. 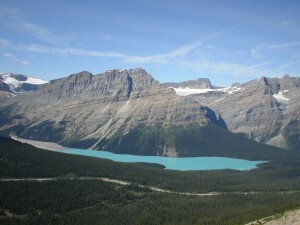 Did you know the best view of Peyto Lake is at look out Bow Summit? This scenic view is about half hour of Lake Louise. This moment has been taken long time ago, we were scrambling Observation peak. It is an unforgettable picture of the summit with a view of this glacier lake on a majestic blue sky. It was my second scrambling in Banff National park; I will always keep this magic memory in mind. While you are traveling on the most beautiful highway in Alberta: Icefield Parkway, pay attention to the beauty around you. It is a highway mixed of massive and sharp peaks, incredible mountains and glacier lakes. Please take a deep breath and enjoy the road. Always keep in mind we are in Banff National Park and we cohabit with unique and precious wild life.